With the recent disappearance of the Sony Reader PRS-650 and PRS-950 on Sony’s website and most retailers, it is apparent that Sony is getting set to launch a new line of ebook readers, as they tend to do in the third quarter of recent years. Today Bloomberg posted an article that says the new Sony Readers will be out in August, according to Phil Lubell, vice president of digital reading for Sony. The new Sony Readers are expected to cost between $180 and $300, which is the same as the current pricing structure. They are expected to come with WiFi for downloading ebooks directly from Sony’s ebookstore, as well as other software and hardware upgrades—no juicy details yet unfortunately. Sony is also planning the upcoming release of their own line of tablets, and wants to continue selling ereaders as long as tablet pricing remains like it is. “We think there will still be a market for dedicated readers as long as tablets remain in the $500 price range,” Lubell said. So what will the new Sony Readers bring to the table? In all likelihood they will be 90% the same as they are now—E Ink Pearl screens, Neonode touchscreen, support for Adobe DRM, on-screen notes, highlights, dictionary, support for audio and memory cards—but with a few much-needed upgrades to compete with the likes of the new Nook, Kobo, and of course the Kindle. On the upgrade front, the Sony Readers could greatly benefit from WiFi and more styling options for ebooks. There’s only one font type and no way to modify the layout of the page with the current models, not unless you use Calibre to setup the CSS of a DRM-free ebook yourself. The Sony Readers also need better landscape mode. The PRS-950 does landscape well, but the others are pretty bad, repeating sentences on every other page. Of course there are a number of other details that could be addressed as well. What upgrades do you think the new Sony Readers will have? I think the new sony could come with 3G or be running based on the android. 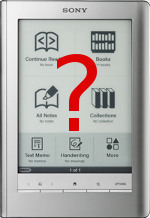 Now, It’s really a shame that the only interest of Sony company in the Ereaders market it’s related to price. For me tablet and ereaders are different products. The research for new epapers, specially the color one, would drop considerably if companies like Sony became more interest in tablets. For me this research should continue to produce a color screen without refresh that could be use in netbooks, which would increase its energy autonomy. I own the Sony PRS-950SC Reader Daily Edition and I’m pretty happy with it. The web browser could use a few tweaks in order to better wrap web page content so you don’t have to scroll side ways. Reading web pages and Twitter feeds on a 7 inch screen is quite productive, provided the text wraps and can be resized if necessary. I would prefer these enhancements over landscape screen orientation for the web browser. Web pages are more deep than horizontal and scrolling vertically will take more time to read. The web browser should also get file download capability to either open an appropriate formatted document to read (epub or Adobe .pdf) if you click on the link or be able to have the save feature and specify whether the file is saved to the reader’s memory or the memory card. Also, the browser home page should be able to be changed since pointing it to the Sony Store web site creates problems when the Store site is offline such as this morning. It makes for a messy browser experience. In all fairness the browser is pretty robust. I’ve noticed it has cookie support as well as java script support and has worked well with most of the web sites I visit. And I do second Nathan’s observations about the formatting capabilities with the fonts for reading epub books. In most cases I’m finding the font size is one notch too small and could use adjusting or being able to use different fonts, make line spacing adjustments, etc. would be great. Also, the Adobe support is the best I’ve seen on any e-reader (including the new Kobo and Nook). Sony has been very good at supporting all e-reader functions in both epub and Adobe formats (highlighting, notes, bookmarks, dictionary access, syncing, etc.). But the mobile Adobe support should be upgraded to the current Adobe standard and for bonus points implement embedded search index support and battery life should improve. I’d like PRS-950SC a lot more if it had a 4:3 screen ratio. The model available feels awkward, more like a tablet than an ereader. It’d also be nice if the new models have fewer buttons. The device is ugly in my opinion. Well.. I don’t own any ereader… but i have been searching for the right one for me.. for a couple of years or more.. (!) The Sony is the most solid one.. for me of all the competition available. I – basing the OS on the Android would be golden!! – bigger screen size one of 1 of the readers : 9″ or 10″ .. so one can work with PDF and documents etc.. A lot of us not only need an ereader device to read books.. but also study and/or work on a non-eye-damaging and portable screen _ so being able to download pdf from hyperlinks would be really really! great too. – bluetooth .. so one can plug a keyboard in, for eg.. , would be a nice feat too. – the 3G option, as also already mentioned would be cool. – a little tweak (which is probable to happen) on the ergonomics. materials give a solid and trusty feeling but the ergonomics are not the best. plus, all those aluminum frames reflect under the sun. On a more specific ending.. owning a 9″ or 10″ ereader would also allow me to use it as a music-sheet / score on a stand.. replacing it with Kilos! of tree killing paper!